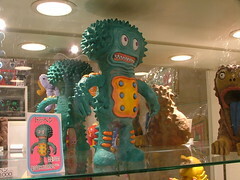 Another great show was the kaiju-influenced Picopico at FewMany!!! Some nice one one off figures, stuffed critters (with teeth) and a crazy pair of headphones. Check out the flickr stream by clicking on the image. 10/31 - 11/6 : Mad Barbarians show at fewMany!